Attention everyone who knows they need to attend to their end-of-life matters! Read more about this Resource that will enable you to get your plan finally done and dusted. finally get going on something you've been meaning to do for ages, but just don't get around to doing? know just what questions have to be answered about end-of-life to cover everything that's needed? have everything kept in one place, for ease of access? be certain that you haven't forgotten anything? minmize the chance of family arguments after you're no longer here? when it comes to creating a power of attorney, or making a living will (or even an ordinary one! ), you'll be familiar with the nagging thoughts at the back of your mind when you realise yet another year has gone by and you haven't done it. You keep your fingers crossed that it'll all be alright - after all, most people live on to a very old age, and you're not near there yet. Maybe you're afraid your partner will die first, and you'll be left high and dry, not only emotionally, but also because you don't know anything about your family admin/bank accounts/the kitchen territory. Or you're concerned you'll lose your independence when you're older and become a burden on your children or friends. 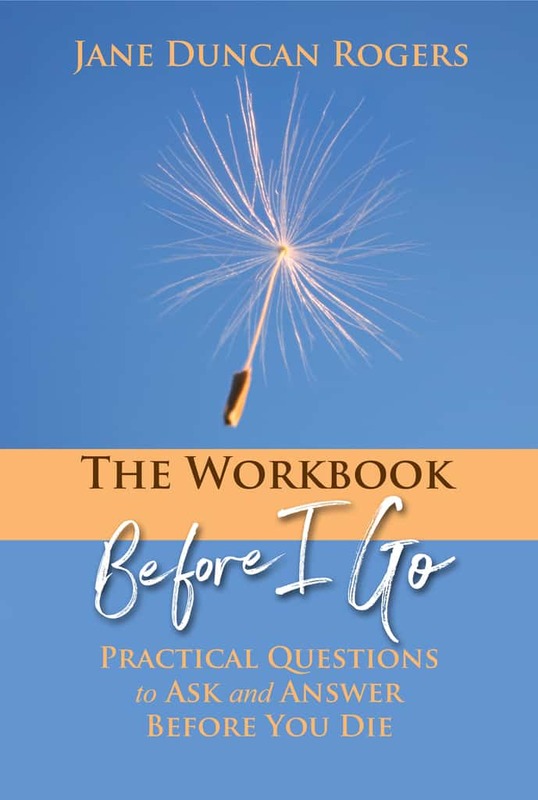 Just imagine for a moment that you are proudly standing in your living room, showing your child, partner or good friend your copy of the Before I Go Workbook. That's your end-of-life plan, all in there. It's all completed, with your wishes and information neatly laid out, and you're telling them it's exact location. Think of the sense of relief, satisfaction and pride that you had finally got round to attending to all this! I know how very important this is, because just recently my parents both died within the same week. A year previously they had completed their Workbooks. 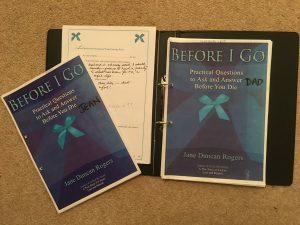 While me and my siblings were stunned at the unexpectedness of losing them both in such a short space of time, the admin around the death, funeral and executor duties has been made so easy - because of what they had entered into their Workbooks. (There they are opposite, an earlier iteration of what is on this page). 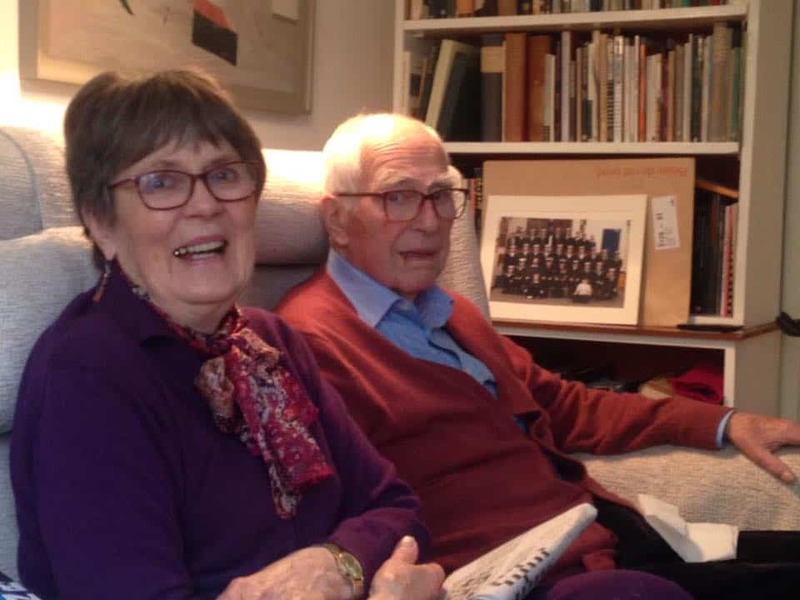 Almost every day at the moment I am being grateful to them for what they did in this respect. It was a completely selfless act on their part, and so much appreciated by me and my brothers and sister. So what is actually in the Workbook? Here's just a few of the many questions the Workbook covers, alongside further information about wills, powers of attorney and living wills. What do you want done with your body after your death? How do you want it dressed? What do you want done with your social media presence? Do you want to write your own eulogy? Who would know your passwords? And this is just a sample of many more things to consider that will give YOU peace of mind now, and give your relatives less hassle, heartache and hopelessness after the end of your life, just like I have experienced in relation to my parents. Available now as a fillable PDF for you to print out or complete on your device. Now includes a 9-page recommended Resources Pack, to take the stress out of finding out what you want to know! "Very well-thought-out workbook and handouts. I feel optimistic about my end of life arrangements and indeed about ageing without children; I feel empowered now and no longer a victim of circumstances". "Thank goodness. A completed your workbook. 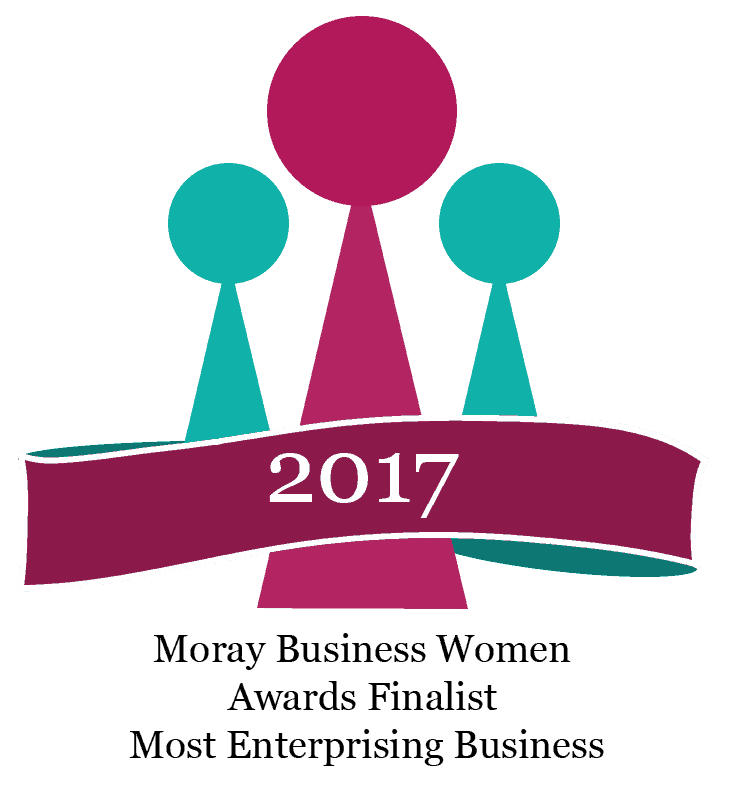 I'm so glad she did; her instructions were quite clear, which I found very helpful". "Very comprehensive manual, all in one place, so manageable and I can't lose bits of paper as I usually do". Why is it so important to complete this Workbook for yourself? I know it's a bit of a gloomy subject, but take it from me, it can actually be enjoyable! Upon purchase you'll be redirected to a page where you can download it in PDF format, and which you can complete on your device.